In March the service committee participated in the quilt show at F.I.T. by having a charity booth. We would like to thank all who participated in keeping the booth well attended during the weekend. We had many interested people come by and ask questions. Also many people commented that the quilts displayed were so beautiful that they thought they were part of the show. We had three sewing machines set up and we had a section for people to do hand work on bindings and hand quilting. There were a few young parents who came by with children who explained that their grandma or mom used to do hand sewing like that. And they were excited to see hand sewing demonstrated as well as the sewing machine work. During our April Empire meeting we distributed the following quilts to our charities. We would like to thank all of the members for bringing in and completing the quilts that were started during our charity day. We got several of them back this month and they were distributed to our charities. 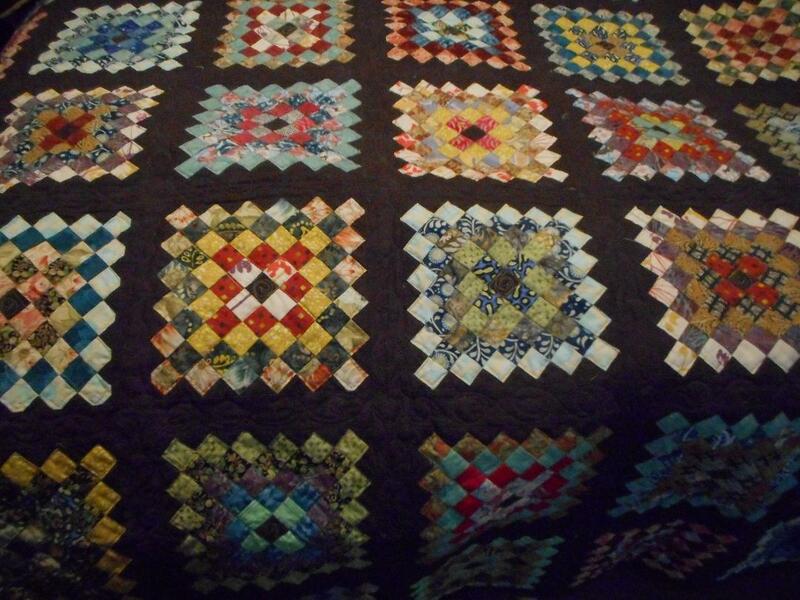 During the May empire meeting we will be raffling off a postage stamp quilt that was completed by our members. It is multi colored and has brown borders. The ticket prices are $2 per ticket or $5 for 3 tickets. On March 9 we held our annual charity day event at the meeting. The service committee would like to thank all who participated. The quilts that were created are truly appreciated by our charitable organizations. A special thank you goes out to all those who managed all of the stations around the room such as Janice with the batting and backing material, the people who assisted with cutting batting and fabric, the people who layered or tied the quilt tops and the people who brought their sewing machines. Of course, we can’t forget to thank the people who made tops and brought in tops or backing fabrics. Also a thank you to Karen and Shune for assisting me in getting all of the guild's supplies to and from the meeting and to Aurifil thread and Fairfield batting for their generous donations. At the very end of the meeting a couple more quilts came in from the people who were tying quilts during the day. On our list 10 additional people indicated that they were taking home quilts to finish. The total for the day was approximately 60 quilts once the ones from home come in. The service committee is very happy with our successful charity day turn out. And thank you all for sharing your quilting equipment, expertise and time with us to create so many wonderful quilts for our charities. If you are thinking of adding a charity to our list we need some information. Firstly, we need either a letter or an email that has the 501 (c)(3) number as proof of the charity's non profit status. The second piece of information that we need is a statement with a description of what the population is served and their ages. Also what size quilts are required. All of this information can be included in the one letter or email. The service committee thanks all of our members for their continued support. During our October meeting we collected 27 quilts, a pillow, 9 quilt tops and 2 wheelchair bags. I gave out three quilts that need to be bound and the 9 quilt tops to be finished. If you are thinking of adding a charity to our list we need a couple of items. The first is a letter with the 501 (c)(3) number in the letter as proof of the charity's non profit status. The second item is a letter on the organization's letterhead stating the size of quilts needed and a description of the ages of the population that the charity serves. Charity Coach and Chat is now headed by Claire Surovell. The Service Committee is looking for members willing to demonstrate basic and intermediate techniques for making quilts, stuffed animals, or other items we donate to the many charitable organizations we support. Long-standing members: Please email the Service Committee at info@empirequilters.net and let her know if you would like to help by attending one or more of these Charity Coach and Chat sessions or to answer questions from newer quilters. The sessions will be held from 11:00am to 1:00pm, before our regular meetings. Newer quilters: Make your charity quilts with us! By coming to these Charity Coach and Chat sessions, you’ll learn all you need to know about making beautiful, useful charity quilts. During these sessions, you’ll learn how to plan, cut, sew, and finish your charity quilt. And we’ll also talk about making other items — like the holiday stockings and teddy bears. The members who attended our monthly sessions this year not only learned how to make charity quilts, they picked up techniques they now use to make their own beautiful quilts. This is open for all members and guests. We look forward to having a lively time with many people. Each year we have one meeting dedicated to assembling quilts for various charities. It is a fabulous time to learn and work together. There are so many people in need, and we can use your help. Do you want to help, but you're not sure how? Here are suggestions to get you started, and some great ideas of projects you can do over the summer. Preemie Quilts — 16" x 24" quilted by hand or machine and washed in Ivory or Dreft. Absolutely NO tied quilts, no buttons, no pompoms. Crib Size — 36" x 36" – no larger than 45" x 45"
Nursing Home (Wheelchair) — 36" x 36" No larger, please, as we do not want our beautiful quilts to get caught in the wheels. Summer Camp-minimum 60" wide, 80" long. Blankies, for pedriatic patients: 42" x 42" or larger, for ages newborn to 21 years. NICU Isolet Covers: 30" x 36" in light colored fabrics. Must be quilted, not tied. On a large flat surface, layer (top to bottom): Batting, Top Fabric (right side down), Bottom Fabric (right side up). The right sides of your top and bottom fabric will be together. Sew around the border of three sides, and 3/4 of the way around the fourth side. Leave an opening and turn the quilt inside out. Your top layer will be in place, with the batting in the middle and the bottom layer on the bottom — just where they all belong! You are now ready to quilt or tie! ›› Print These Instructions (PDF Format) ‹‹. This is another way to finish off quilts rather than doing the pillow turn method or making separate binding and sewing on. This works up very fast for charity quilts. This should be done with a machine with walking/even feed foot. The top and batting should be the same size with the backing about 3" larger. Lay the backing face down with the top and batting centered on it, face up. Trim the backing to 1" all around. Turn the backing in ½" to meet the top/batting. Turn in again ½ to cover the edge of the top/batting. Finishd block size is 7" and there are 30 blocks total, five rows of six each. Each row is the same, with rows 2 & 4 upside down. Start with a 6" square of a print fabric – 30 needed. Cut 30 2" x 6" pieces of assorted solid or small prints. Cut 30 2" x 7½" pieces of assorted solid or small prints. Sew the smaller 2"x 6" border to the squares. PRESS to border. Sew the 2"x 7½" to the square. PRESS to border. Sew in rows of six alternating the side border right then left, border always on bottom. There are five rows. PRESS. To assemble, lay batting down smooth, lay backing on top, face up. Put top face down and pin baste around edges. Sew ¼" from edge of top all around leaving a 6" opening. Turn right side out and quilt by machine or tie. Close opening. Start with a panel or large focal print measuring between 16"-22" x 22"-26" or two smaller panels with sashing in between. You will want your finished quilt between 36-40" wide and 40-44" long. If your panel is 16"x24" you will need 10" each side to make 36" x 44"
36" – 16 = 20" / 2 = 10" 44" – 24" = 20" / 2 = 10"
This 10" border for each side can be two 5" borders or three 3-4" borders. All strips can be different or same, 1 long or pieced. This is like a giant log cabin block with the center the focal fabric. If you have a serger, this is a good place to use it, as ¼" seam allowances do not have to be accurate. Sew strips to each side, then top and bottom. Repeat. When finished, PRESS. It is just nine or 13 pieces and very fast. To assemble, lay batting down smooth, lay backing on top, face up. Put top face down and pin baste around edgges. Sew ¼" from edge of top all around leaving a 6" opening. Turn right side out and quilt by machine or tie. Close opening. ›› Print These Instructions (in PDF Format) ‹‹. These instructions are compliments of Elaine Jansen of Sewright in Bayside. FABRICS: Yarn dyed woven cottons or cotton flannels work best (homespun, flannel, madras). WASH or NOT? If there is any question of color running — WASH! To calculate the amount of different fabrics needed, divide the total yardage by the number of fabrics — i.e. baby quilt: 3 divided 6 = ½ yard of 6 different fabrics. Sew an "X" from corner to corner. This completes the block. Sew blocks together using a zig-zag stitch and a ½" seam, to desired size. When size is reached, in place of a binding, sew a zig-zag stitch ½" from raw edge around the entire quilt. Snip raw edges on seams and border 1/8" to ¼" apart. Take the completed quilt to the laundromat and wash and dry. It may take two washings to completely the edges to your sasisfaction. ›› Print These Instructions (in PDF Forma) ‹‹. Just sew strips of fabric either horizontally or vertically to desired size. Add borders if desired. Complete as in option "A" above. We collect stuffed animals for the holidays to be distributed to shelters, etc. for children. Use any fabric you have to make the animals. We will collect the stuffed and sewn animals at the November and December meetings only. We cannot store these stuffed toys in any of our homes, so we will collect them as close to the holidays as possible. Eyes, nose and mouth can be either drawn on with a Pentel Pen or embroidered on the animal. No buttons, doll eyes, doll noses, please. If you have a piece of fabric left over that will make a nice stuffed toy for a child, please go ahead and make it — some child will just love it. The finished size of the bag is 18" wide and 15" deep. A pocket on the outside is also a good idea. Use ½" seam allowance and double reinforcement. The handles finish to 6" (cut 12½"). Sew handles to the very edge of each side to hook onto the wheelchair handles. Any type of material can be used for this project. Material that is a little heavier would wear better. By doubling the length of the material, you will not have an extra seam. Select which instructions you wish to download. The instructions are in .pdf format. Note: For Drawstring Bags and Stockings please use a HALF INCH seam allowance instead of a quarter inch seam allowance.